Mehandi is one of the essential parts of any marriage and auspicious ceremony among Indians as well as the Eastern Countries like Arab, pakistan etc. 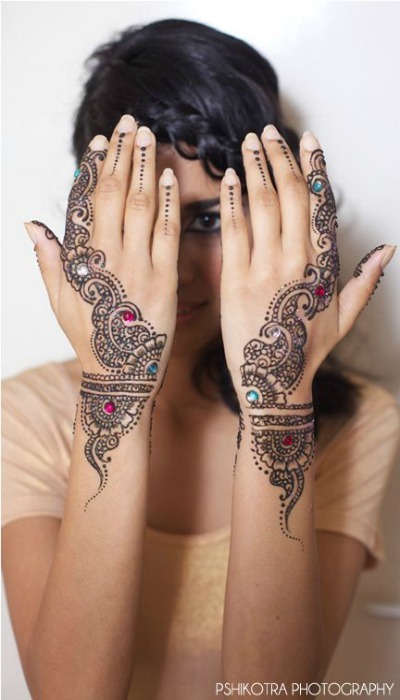 Speaking of Arab, they have some of the best mehendi designs popular as Arabic Mehendi designs which are usually made using Black mehendi and have intricate patterns and designs. They are different from the standard Indian Mehendi you might see everyday but slowly arabic Mehendi Designs are being used for Regular Indian mehendi designs as well. Black mehendi is a type of Mehendi which is now used as a Hair Dye and is quite popular in the Western countries to use as temporary tattoo material. This black mehendi is dark and makes temporary tattoos look like original. 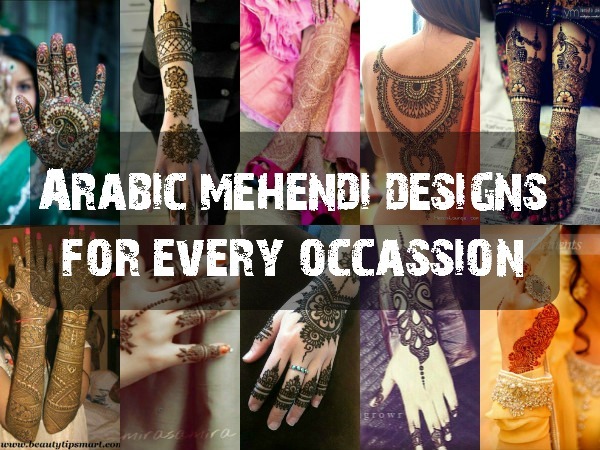 When you’re choosing Arabic mehendi Designs you may get confused with so many options and search results. 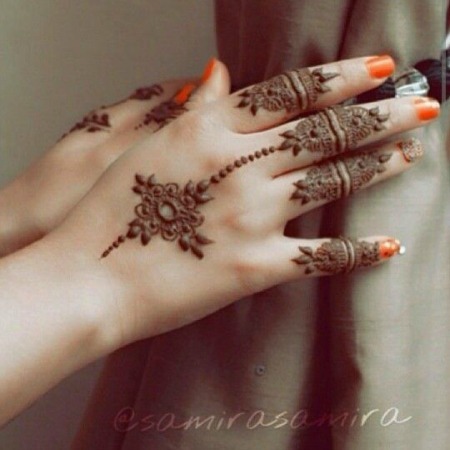 So we have presented here some of the best Arabic mehendi Designs for you to try. 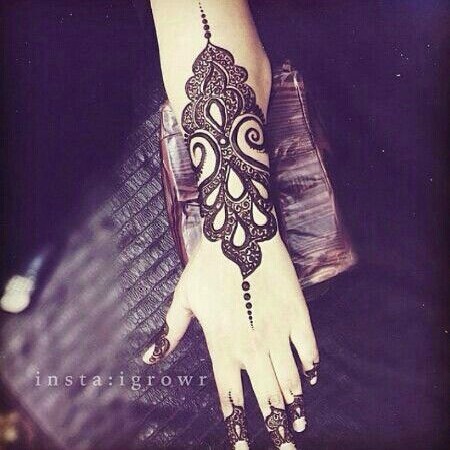 Arabic Mehandi designs are quite popular now on Pinterest and Social media and many people have been seen flaunting them. 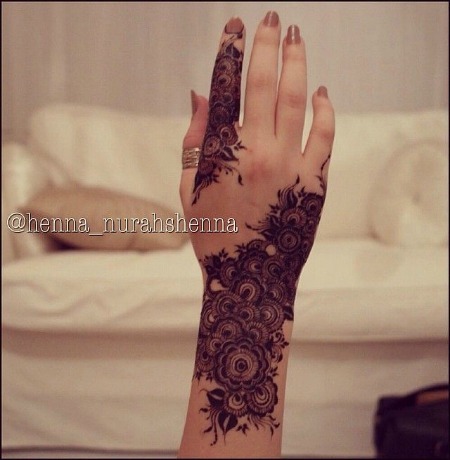 here’s some popular and trendy Arabic Mehendi Designs to try . 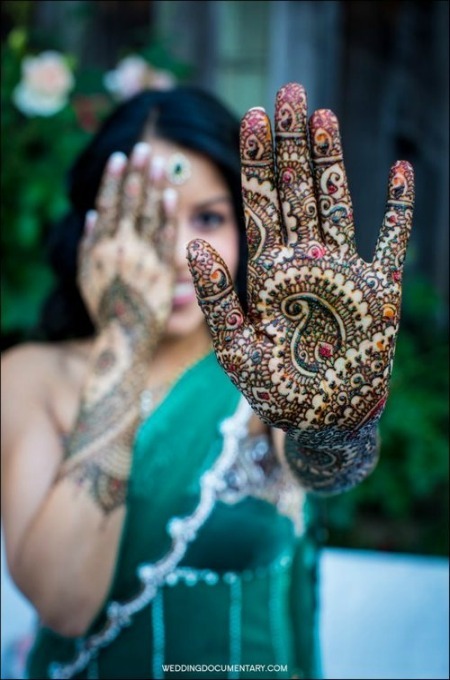 A half hand Mehendi will be a great choice for festivities and for weddings . 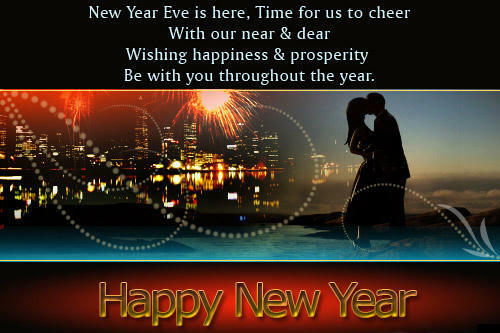 but you don’t need to have an elaborate design to turn heads on your special day. 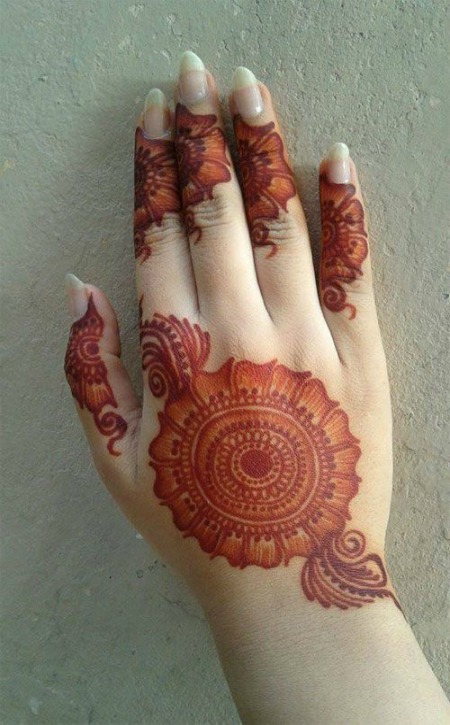 This easy and simple Arabic mehendi Designs is so simple yet looks elegant.The circular and floral patterns do justice to the beautiful design and the paisley design finger tips also look great. The bangles mehendi design on the arm also looks quite modern . This beautiful design is perfect to grab all eyeballs during a special event. The motifs and designs used here are elaborate and finely done. The design has multiple angle mehendi designs which end in a single thread reaching the middle finger. The design is classy yet modern and is a great example of the designs you should definitely try when doing Arabic mehendi designs. This colorful mehendi is a treat to the eyes and look beautiful on a Bride . Colorful glitter is used to make the mehendi look colorful and vibrant. the paisley designs and intricate designs make the mehendi a perfect choice for brides. These Jewellery Mehendi is a great way to dress up your hands in the way of wearing a hand flower. The large flower motif in the middle and the bangle design on the wrist is very modern yet looks great for any traditional event. 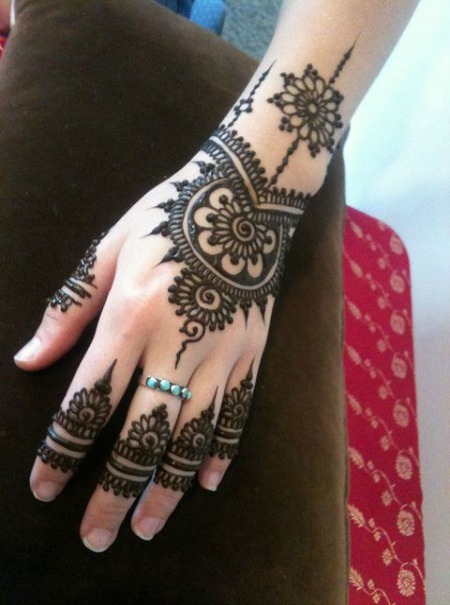 arabic Mehendi Designs can also be done with standard mehendi like the one above. The circular pattern in the middle takes the attention of everyone while the small flower motifs on the fingers make the design look elegant and a whole lot girly. This design represents Bridal mehendi to the fullest . The elaborate design starts from the toes and ends near the knees and is strictly for the Bride to be. The design has many intricate patterns but paisley , flower and round designs make up for the most of the parts. 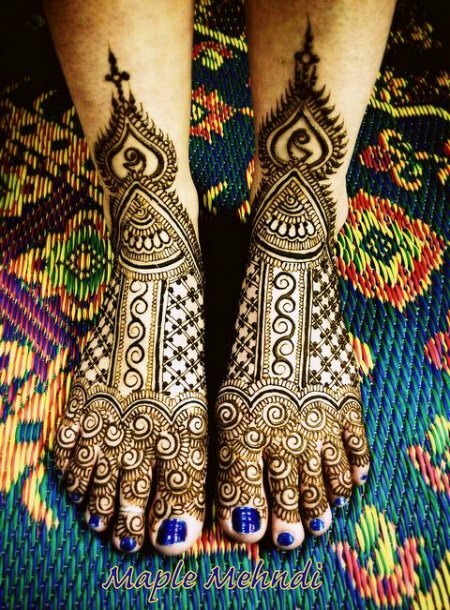 Feet Mehendi designs are really popular these days and Arabic Mehendi Designs would be incomplete without some feet mehendi designs. The spiral designs and the Weaved designs make for a beautiful combination here. 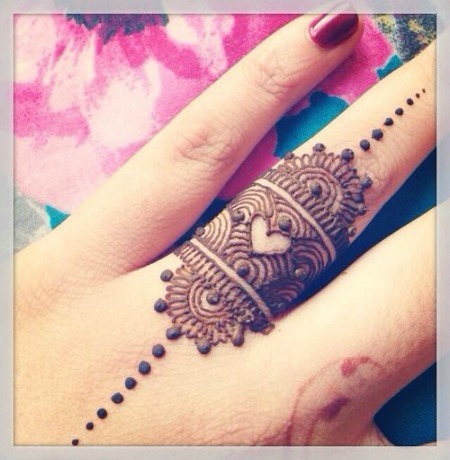 If you want to highlight your ring finger for the special day like engagement or wedding this arabic mehendi designs will surely be a great choice. Why shy away from a full length Arabic Mehendi Design when you can flaunt it in style with your backless blouse or dress. this beautiful Arabic mehandi Design has golden glitter used to highlight the design. 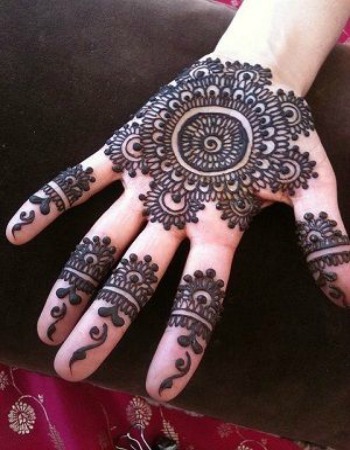 You can have a beautiful half hand Arabic Mehendi done for a special function or occasion even if you’re not the bride. They look very traditional and are so intricately done. here the designs are very intricate . 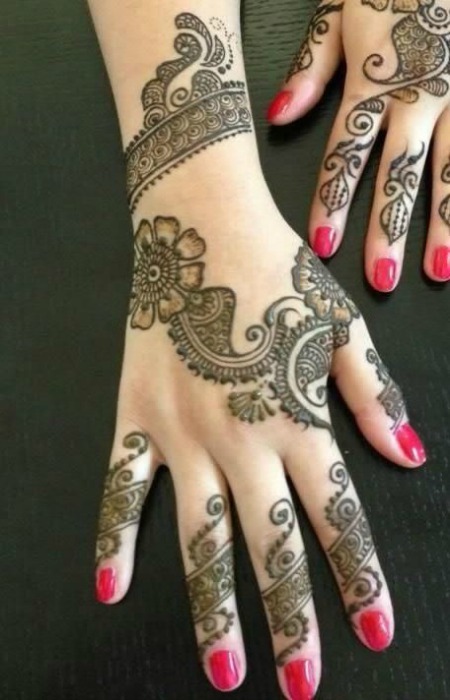 This round Arabic Mehendi designs looks really great and has a large circular/round pattern at the middle of the palm and the fingers are decorated with black mehendi designs. This intricate design is perfect for a wedding and will make your hands stand out from the crowd The heavy intricate patterns and motifs make this a perfect choice for those who love full hand mehendis. 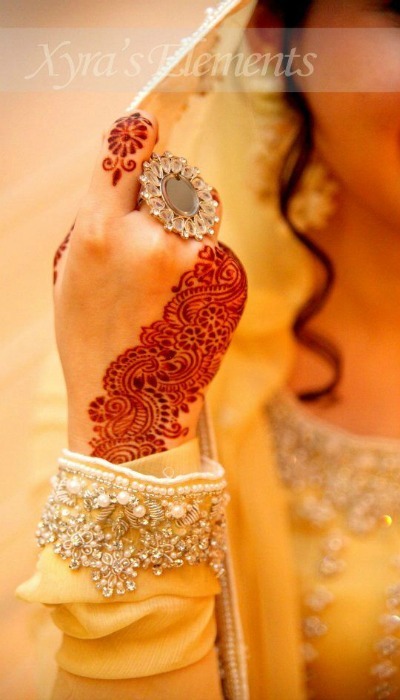 Bangle designs on the arm, paisley and spiral motifs are largely used for this Arabic Mehandi designs. 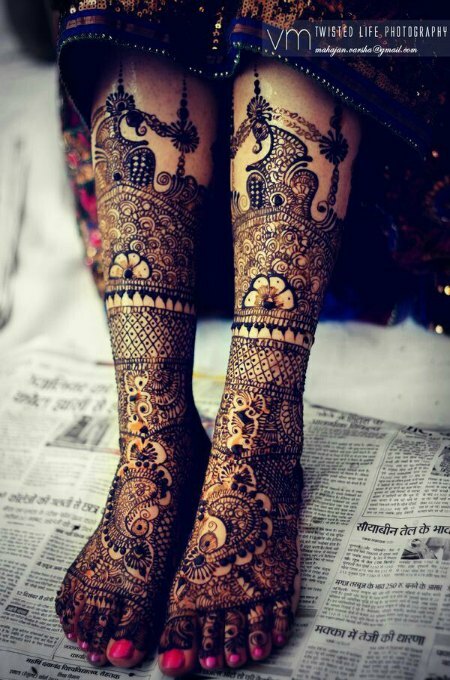 this elaborate feet mehendi designs is perfectly fitted for a bride. The mehendi design here uses most of the motifs ad styles like the paisley motif, the floral motifs, shading as well as the weaved patterns. Black mehendi helps to keep the design prominent and helps make it stand out. This arabic mehendi design uses small and intricate designs like paisley, floral and spiral motifs to decorate . The design starts from the wrist and goes on till the little finger. the other fingers are done using small floral designs. Colorful rhinestones are the main attraction of this beautiful designs. the design starts from the wrist in the form of a bangles and then proceeds towards the index finger. For the other fingers simple dots are used . 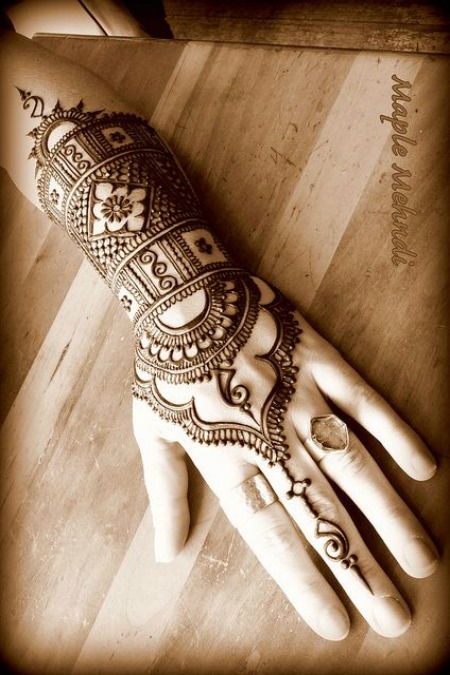 This arabic mehendi design is very modern and different from the ones you see everyday. There is a lot of open or negative space left out intentionally. the fingers tips are decorated and the rest of the hand is kept bare. The main design is done at the middle of the hand with spiral and paisley motifs. 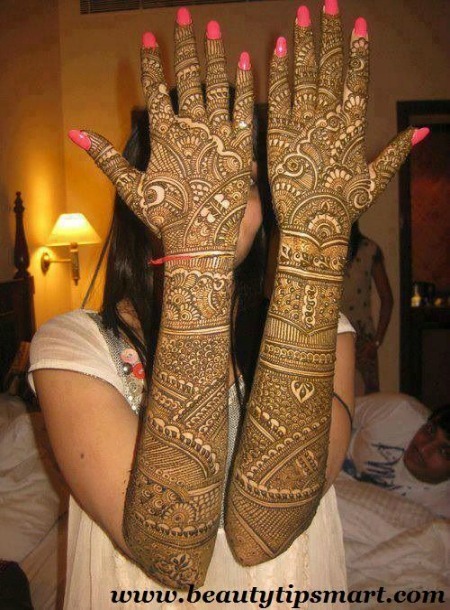 Arabic Mehandi Designs like the one above is surely becoming more and more popular. The intricate spiral designs look beautiful against the skin. here the designs starts around the wrist and moves along the right side of the hand , and the index finger is also covered in beautiful patterns . 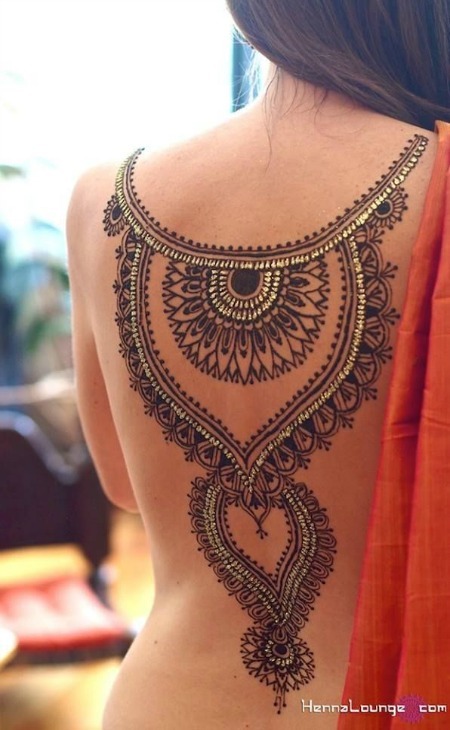 This lace like patterned Arabic Mehendi Designs is so beautiful yet it is not cluttered . there is a lot of negative or open space left on the hand so that the designs stand out . Paisley and flower motifs are mainly seen in this design. 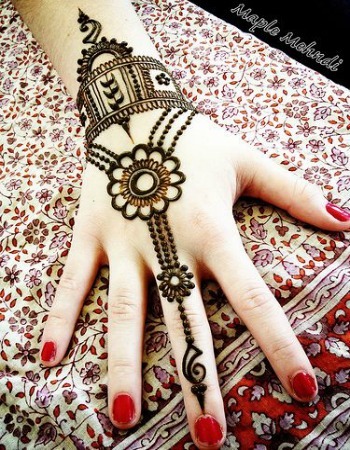 This beautiful Arabic Mehendi Design suits any special occasion . The fingers are dressed up with small motifs in the middle; there is a bangles like design which connects with the central design at the middle of the hand. 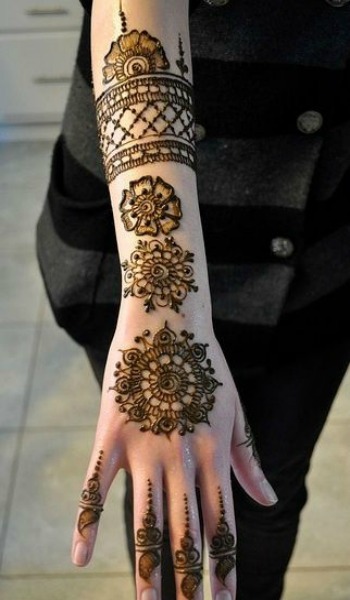 This arabic mehendi design is small and has a medium motif in the middle. The fingers are covered with intricate designs. 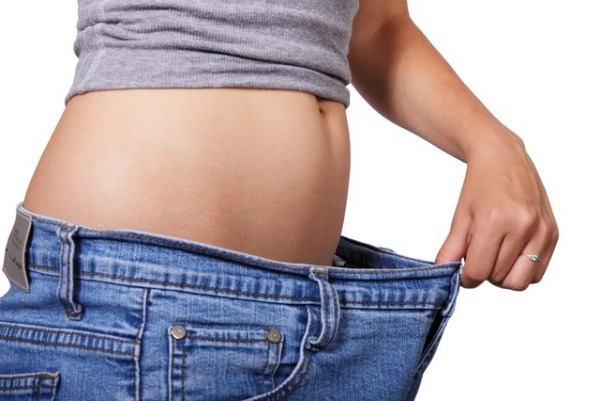 The small design is unique and will get you a lot of praises. Hope these designs have helped you to make up your mind. You can easily choose the best Arabic Mehendi Designs from this list and do it for the next auspicious occasion in your home.